Bring an unparalleled level of beauty and elegance into your home by coming to us for our selection of wood look tile in Cypress, TX. With the latest advances in machining technology, it is possible to perfectly mimic the look of real wood on tile, right down to the grain. 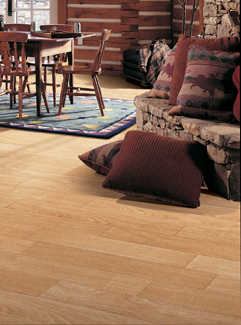 You not only get the beauty of hardwood but the durability and ease of maintenance associated with tile. At Flaherty's Flooring America, we provide our clients with the latest in tile technology from the leading manufacturers in the industry. While hardwood is a beautiful and sought-after flooring type, it is not ideal for rooms that experience a lot of moisture, such as kitchens and bathrooms. These spaces tend to experience more spills that can damage hardwood by causing it to expand and contract. For this reason, designers tend to steer away from wood in these spaces. The solution is simple -- wood plank porcelain tile. With our catalogue of wood-look flooring, you can easily replicate the beauty and elegance of hardwood in rooms where it is otherwise unwise to put it. With high-quality materials made from the finest fired clay, you can expect your new tile to hold up to moisture, spills, and splashes for years to come. For decades, tile has been the favored flooring choice for bathrooms and kitchens in homes all across America. This is because tile, including our gorgeous wood plank ceramic tile, can fit into any space, holds up to the heavy foot-traffic of these rooms, and doesn’t show wear and tear for years. Both ceramic and porcelain have extreme durability and lifespan, and they are incredibly easy to care for. Because they are resistant to water spills and various types of stains, they require little long-term maintenance apart from basic cleaning. Porcelain and ceramic wood tile are ideal choices for the busy home, holding up to pets and children without sacrificing beauty. Schedule an appointment with a member of our team right away to find out more about all of the options available to you. We are devoted to your flooring project from start to finish, giving you all the resources you need to find the perfect floors. With our team of designers and flooring experts on your side, you are sure to find the ceramic or porcelain tile you need to bring your flooring dreams to life. Contact us to find out more about the many benefits of wood tile. We are proud to serve Jersey Village, Spring Valley Village, Cinco Ranch, Bellaire, and Cypress, Texas, and the surrounding area.